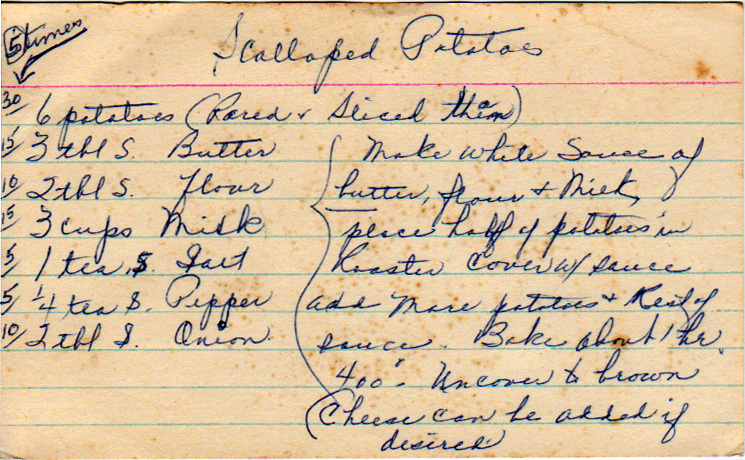 You know it’s an old recipe when it says cheese is optional. These days, if you serve someone scalloped potatoes without cheese, they’re likely to look at you funny. Careful if you follow the “times-five” instructions. I’m not a mathematician, but I think five times a quarter is less than five. From the box of D.E. from Maumee, Ohio. Make white sauce of butter, flour and milk. Place half of potatoes in roaster. Cover with sauce. Add more potatoes and rest of sauce. Bake about one hour, 400 deg. Uncover and brown. Cheese can be added if desired.